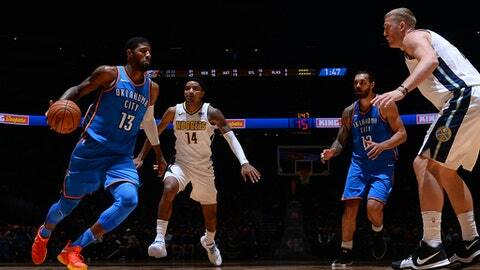 DENVER (AP) In a tight game down the stretch, there was no letting up by Emmanuel Mudiay and the Denver Nuggets. ”Every season you go through adversity and right now we’re going through ours,” Westbrook said. Oklahoma City fought back to within 93-90 but Milsap answered by converting a three-point play with 2:09 left to rebuild Denver’s lead to six. The Nuggets have won six of their last eight games and improved to 7-5 on the year. It’s the first time in six years they’re at least two games over .500 in the first 12 games of a season. They opened 8-4 in 2011-12. Thunder: Westbrook was treated for a facial cut early in the game after taking an elbow to the face while guarding Jokic. The injury did not prevent him from continuing to play. … Beyond his impact on the floor, Anthony has proven to be a steadying influence in the locker room. ”He’s got a world of experience and a world of wisdom to share with our guys,” coach Billy Donovan said prior to the game.